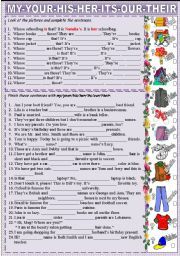 Very easy sentences with possessive adjectives. Please let me know if you find any errors and I´d love to hear your comments about my materials. Salam. 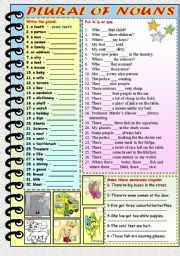 Some easy sentences to practise plurals with verb to be(simple present).Editable. Thanks to Philip Roeland for the template and for your comments about my work. Salam. 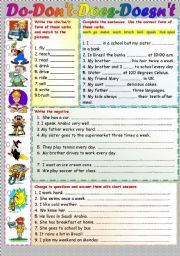 Easy exercises for beginners to practise Present Simple - affirmative - negative and interrogative forms.It´s editable and I hope it´s useful to you, too. 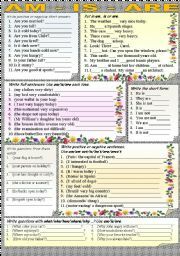 http://www.eslprintables.com/printable.asp?id=389462#thetop - in this link there are some cute bookmarks about this subject. 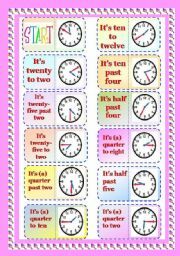 Bookmarks with classroom language specially for kids with sentences and images so they can understand them. Thank you for downloading them and a special thanks to Totya for helping me with it. Salam. 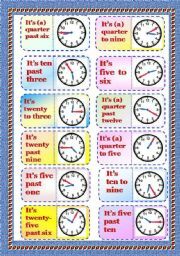 Graminoes Part 1/3 - Telling Time. First part of my graminoes about hours. As a muslim I do NOT use dice in my classes. The student with the card ´start´ and best behaviour in class will start the game. If you want the editable version just send me your email by PM. Thank you for your comments and for MJ Misa for the template. Salam. 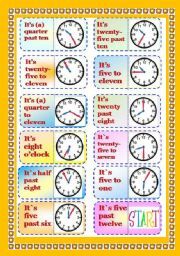 This is the second part of my clock graminoes. As a muslim I do NOT use dice in my classes. The student with the card "start" and best behaviour in class will start the game.If you need the editable version just send me your email address.Thank you for your comments and thanks to MJ Misa for the template. Salam. Dominoes with 24 cards about Possessive Adjectives. You don´t need to use dice. The student with the card "start" will play first.It´s editable and thank you for writing down your comments. Salam. 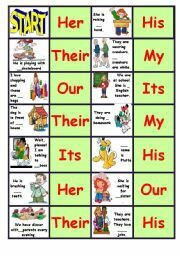 Another ws with easy sentences to fill in with verb "to be". I hope you like it and thank you, Devitsa, for the template.Salam. Last part of my graminoes with hours. As a Muslim I do NOT use dice. So the student with the card `start`and best behaviour will start the game. Thank you for MJ Misa for the template and thank you for your comments. Salam.